Samuel Gompers was born in England where he was educated. When he was 13 his family moved to New York City. His father was a cigar maker, and Samuel became a cigar maker, too. At the at of 14 Gompers became involved with the Cigarmaker’s Local Union. In 1875 he was elected president of Cigarmaker’s International Union Local 144. In 1881, Gompers helped found the Federation of Organized Trades and Labor Unions, which was, in 1886, reorganized into the American Federation of Labor. Gompers was elected the first president of the AFL. He served as president, except for one year, until his death in 1924. After Gompers death a memorial foundation was formed, headed by the AFL, to create a monument to Gompers. In 1928, Congress approved a monument to Gompers. The memorial foundation raised the money. This memorial was designed by Robert Aitken of New York City for the triangular plot of land at Eleventh street and Massachusetts avenues, near the original AFL headquarters. The statue construction began in 1931 after Aiken’s plans were approved. Interestingly when the memorial was being pieced together there was a dispute with the iron workers. The union of iron workers had recently created a four-hour day for iron workers in order to employ twice as many men. Essentially the 8 hours shifts were split. In order to get the work completed on the Gompers memorial but also on the Archives building, the Department of Justice and the Government heating plant – all being constructed at the same time – exceptions were made to the new union rules. The memorial cost approximately $100,000 raised by the memorial foundation. The ceremony was held at 10am Saturday, October 8, 1933, with President Franklin D. Roosevent and William Green, president of the American Federation of Labor, addressing the crowd. There were about 8,000 people who attended the unveiling. In 1983 a movement was started by the metropolitan labor council to refurbish the memorial to Samuel Gompers. The same fundraising campaign also included a proposal to erect a memorial to A. Philip Randolph, founder of the Brotherhood of Sleeping Car Porters, who died in 1979. 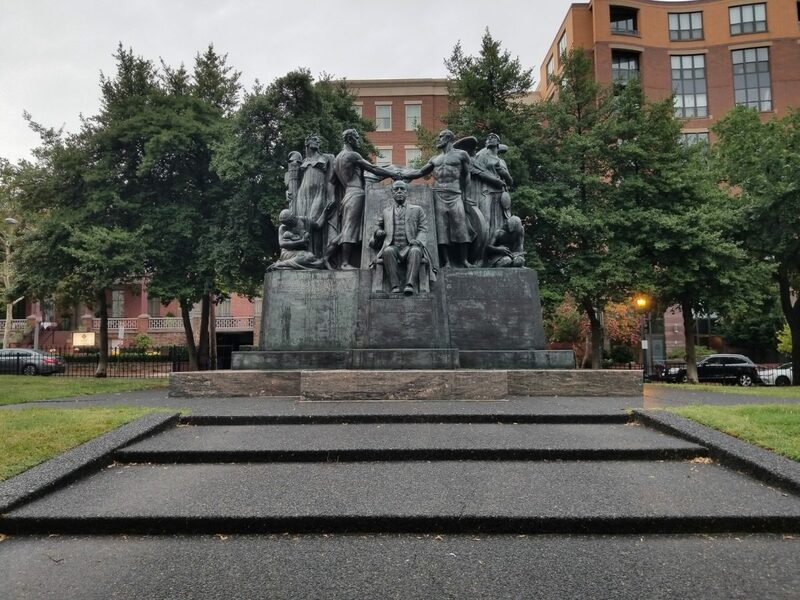 Although the Gompers memorial was cleaned and the park area refurbished in the early 2000s, a memorial to A. Philip Randolph has not been added to the park.